Located in Tampaksiring alongside Jalan Dr. Ir. Sukarno lies The Sukarno Center, a museum that is often forgotten by tourists. This dainty museum hosts memorabilia from the Indonesia’s first president, Sukarno (also known as Bung Karno), a charming leader whose popularity is still unrivaled by his predecessors. As a son of a Balinese noble from Buleleng, Bung Karno is closely linked to Bali. He even built a presidential palace in Tampaksiring, only a few kilometers away from this museum, which was one of his most favorite palaces and he visited it frequently. Nestled on a one-hectare plot of land, The Sukarno Center resembles a huge Balinese house, which makes it really easy to spot from the main street. A line of Indonesian flags flutter along the road, leading guests to the main gate of the museum. And at the front, an enormous statue of Bung Karno rises majestically, as if welcoming the visitors. The entrance fee to the museum is only Rp. 20,000, and upon arrival guests will be greeted by a number of guides wearing Batik shirts. Wellspoken and courteous, these tour guides are local youngsters from Tampaksiring who volunteer to work in the museum. After getting their tickets, guests will be escorted by one of the guides to the exhibition rooms where they will get a thorough historical explanation. In case you are curious about what the museum has to offer, come and join me as I explore The Sukarno Center. But first of all, take off your shoes before entering the museum as a sign of respect – it is common courtesy in the Javanese tradition. 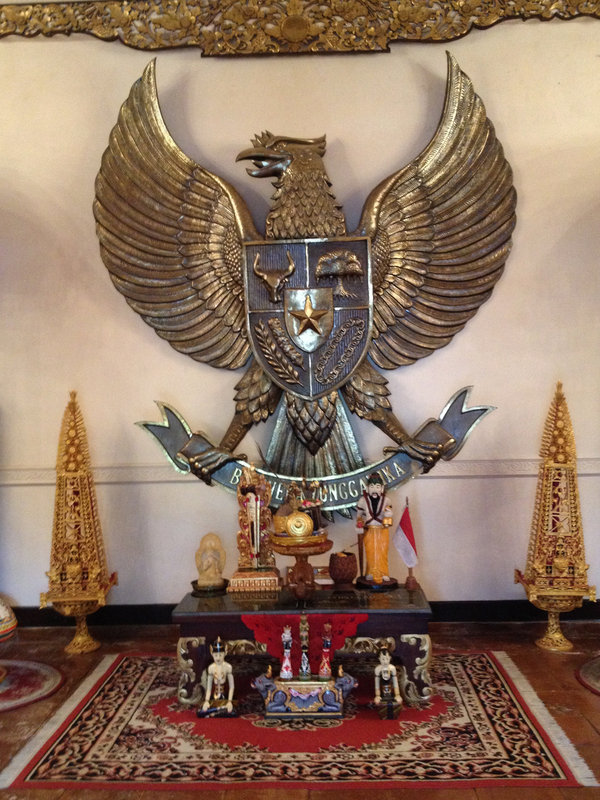 A huge Garuda Pancasila sculpture welcomes the visitors at the front door. The Garuda Pancasila is one of Indonesia’s icons, with five core principles that are the foundation in the daily lives of Indonesians. The Garuda bird holds the national’s principle “Bhinneka Tunggal Ika” which means Unity in Diversity – a slogan reminding people to live harmoniously side-by-side despite the fact that Indonesia consists of millions of people with various traditions, tribes and beliefs. To be honest, this philosophy seems to be quite forgotten in this modern era, and probably that’s why I got goosebumps as I stood in front of the Garuda. As I went further in the museum I was deeply in awe. The Sukarno Center is elegantly arranged and all the collections are beautifully preserved. The décor is modest yet gallant. The interior resembles an antique presidential palace, dominated by red and gold that creates a lavish ambience. There are about 150 old photographs depicting Sukarno’s life as a man and as the President of Indonesia, all of them from his family’s private collection. It was actually Sukmawati Soekarnoputri, one of Sukarno’s daughters, who handpicked and arranged each of the items in the museum. The first floor of The Sukarno Center is divided into several different sections including a proclamation room, a family room and an international room. 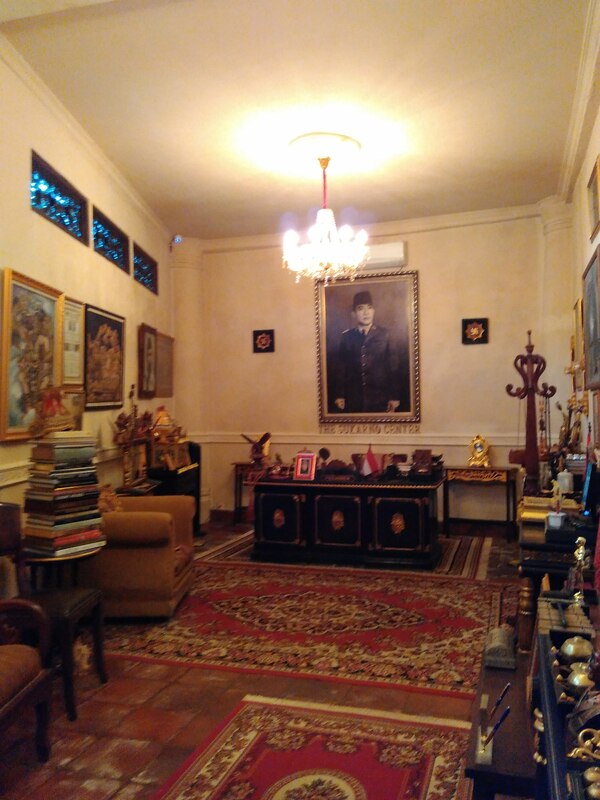 The family room displays the history of the Sukarno clan. Sukarno is famous for his charm towards the ladies as he wedded nine women, among them Naoko Nemoto, also known as Ratna Sari Dewi Sukarno, a Japanese Geisha whom he met during an official visit to Japan, and Fatmawati, Indonesia’s First Lady with whom Sukarno had five children including Indonesia’s first female president, Megawati Soekarnoputri. There are also some photographs of Sukarno with international icons and leaders like Marilyn Monroe, Pandit Jawaharlal Nehru, Mao Zedong and John F. Kennedy. When I passed the proclamation room my body shivered as the voice of President Sukarno resounded from the speakers, citing the proclamation text he announced on Indonesian Independence Day on August 17th 1945. The proclamation room is set to relive the memory of that historical day. A framed hand-written proclamation text with the signature of Sukarno and Mohammad Hatta (Indonesia’s first vice president) is also displayed alongside the photo of these two great men. As an Indonesian, I felt nothing but proud when I witnessed this historical memorabilia that marked the birth of this great nation. deity who is believed to be the Queen of Java’s Southern Sea. 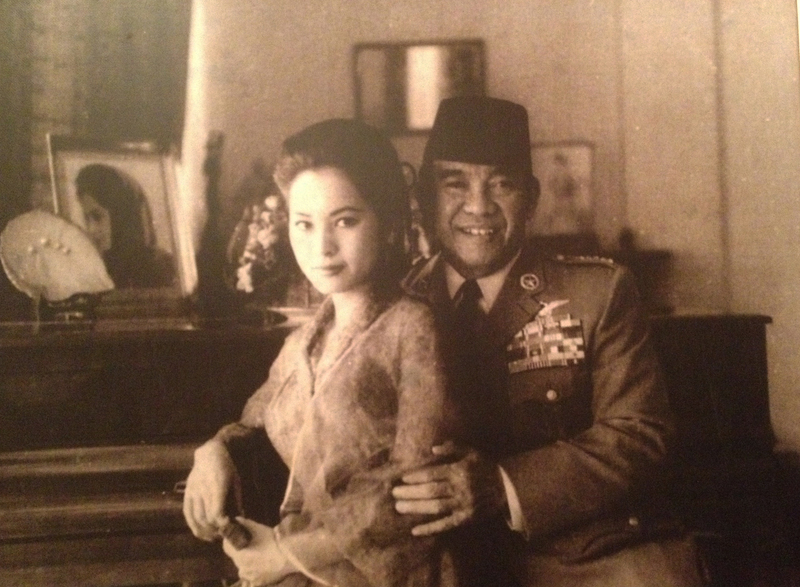 And Sukarno, who was fond of anything mystical, is said to have had a close link with Nyai Roro Kidul. Many also believe that the Queen of the Southern Sea served as a special protector to the late president. This special room is home to all collections related to the Queen including a painting of her in her green attire – some of her paintings were created by Sukarno himself. When I entered the room my guide said that this room is sacred – so women who are in their period are prohibited. Many visitors offer up prayers in this room, including Ibu Sukmawati when she came visit. During my visit I could really feel that the atmosphere of the room was quite mystical, as the scent of the incense placed next to a Balinese offering for the Queen was wafting through the air. After Nyai Roro Kidul’s room I decided to explore more of the museum. Lining the walls leading to the main room are photos of Sukarno during his presidential duties. At that time Sukarno may have been “just” a president from a newborn country, but his charm put Indonesia on the global map very quickly. I believe it was his noble reputation and forward vision that resulted in Indonesia being acknowledged and respected by other countries in the world. Among all the photos in this room, my personal favorite is of him standing in front of the first prototype of Indonesia’s official Garuda Indonesia airplane during his presidential visit to India. It is so inspiring to see him standing there with pride, sending a message to the world that Indonesia is a strong nation. The photo exhibition then leads to a main room that is well protected and only open for special occasions. The room is displaying more artifacts and memorabilia, including a series of command wands that have become a part of Sukarno’s style. At the end of the tour, visitors will get two posters of Sukarno as souvenirs. And as I walked out of The Sukarno Center I realized that this museum reminds me a lot of the Palace of Versailles in France. Perhaps it’s the elegance, the comfort, or the nostalgia from looking at those old historical photos? What I know for sure is that I could feel a huge sense of pride when exploring this historical site. Indonesia is indeed a great nation with a glorious past and hopefully a bright future as well. ← Pieces of Positivity: In 2016, will you take the leap of faith?